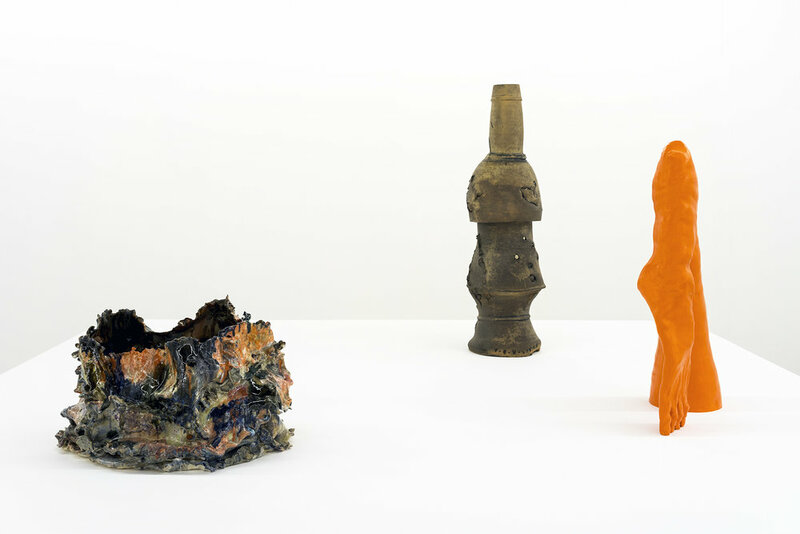 Parrasch Heijnen Gallery is pleased to announce Love Is a Many Splendored Thing, a two-artist, cross-generational exhibition of new sculpture by British artist Jesse Wine (b.1983) and historic works by the late California ceramist Peter Voulkos (1924 - 2002). This collaboration engages ten new ceramic sculptures by Wine in conversation with five important works by Voulkos dating from 1956 - 1980. Together these sculptures reveal a modernist sense of lyricism that runs throughout the oeuvre of both artists. Voulkos’ work in this show comprises three iconic “Stack” pieces, an early “cut out” vessel, and a groundbreaking deconstructed vessel from 1956. Working in a variety of tropes and idioms, Wine engages in a range of imagery using his medium of choice -- clay -- as an homage to the poetics of Voulkos' ceramic forms. A conduit for shared ideals and pursuits, the work transcends generational separations and embraces the core sentiments found within the two artists' varied visions. One of Wine’s works in this show, for example, constructs a narrative alluding to the mythology of Voulkos’ oeuvre and charisma. The guitar body with a supporting human limb makes a “musician" to which a dismembered leg dances, romanticizing Voulkos’ passion as an accomplished Flamenco guitarist. Within this approach, Wine also adopts Voulkos’ well-known “Rocking Pot” form, recreating it, writ large. To Wine, this is the most radical sculpture Voulkos made, an Abstract Expressionist application that simultaneously borrowed from an Asian architectural style and upended a utilitarian approach to ceramics. Wine’s shifting approach to making art is an examination of identity and what it means to have, or not to have, a signature style. This echos Voulkos’ pedagogical mantra “No rules. No rules,” and draws upon ideas of self-expression, freeing oneself from recognized process or style, and developing a unique language. Love Is a Many Splendored Thing was the title of a lost early Voulkos work. No documentation exists, other than the title. Jesse Wine was born in Chester, UK. He received his BA from the Camberwell College of the Arts in 2007, and his MA from the Royal College of Art, London in 2010. Wine currently lives and works in Brooklyn, NY. His work has recently been included in British Art Show 8, Leeds City Art Gallery, Leeds & Inverleith House, Edinburgh, and in solo exhibitions at Mary Mary, Glasgow, Limoncello, London, Franklin Parrasch Gallery, New York, Soy Capitan, Berlin and, BALTIC Centre for Contemporary Art, Gateshead. Peter Voulkos was born in Bozeman, Montana. After serving in the United States Army during the Second World War, Voulkos studied painting and printmaking at Montana State College and received his MFA from the California College of the Arts and Crafts, Oakland. Voulkos began his teaching career in 1953 at Black Mountain College, Asheville, NC. In 1954 he moved to Los Angeles where he founded the ceramics department at Otis College of Art and Design then called the Los Angeles County Art Institute. His work resides in various public collections including, Los Angeles County Museum of Art, the Metropolitan Museum of Art, New York the Museum of Modern Art, New York, the Philadelphia Museum of Art, the Smithsonian Institution, Washington, DC, the Stedelijk Museum, Amsterdam, the Victoria and Albert Museum, London, The Walker Art Center, Minneapolis, MN and the Whitney Museum of American Art, New York. Currently his early work is the is the subject of a solo exhibition at the Museum of Arts and Design, New York.